In tribute to Steve Jobs: Here's how to open a Mac Plus, or any of the old Macs with the integrated screen. First you need to know that there are four screws (of the T15 Torx variety) in the back. Two are near the bottom of the back, and two are deep under the handle on the top of the unit. To reach the screws under the handle, you need a long neck Torx driver (about 8 inches long). Once you've removed the screws, hold the Mac face down, with the screen aimed at the seat of an office chair. 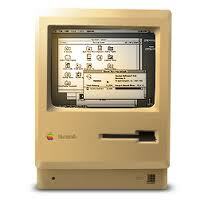 Hang on to the back cover, and give the Mac a good shake. The cover should remain in your hands while the rest of the unit should fall into the chair. Just make sure the unit doesn't bounce off the chair onto the floor! Now that's what I call good design. We'll miss you Steve.